We loved the soap when it came out and now they are introducing a few more skin care products. I tried The Silver Wrinkle Serum ($120/1oz @ corsilver.com) and like the soap, this one harnesses the power of nano-silver with silica, which they claim speeds cell repair in the skin. In addition to that super ingredient, it also contains Copper Tri-Peptides and Palmitoyl Pentapeptide. The PP molecule has shown that it can imitate the skin’s natural rebuilding and renewal process. And they assure that this ingredient is gentle on the skin, so if your skin is sensitive to most serums because of the super ingredients used, this may be one to try. Now this next key ingredient it contains is quite fascinating. It’s called Acetyl Hexapeptide and is an amino peptide that they claim mimics the effects of Botox but without paralyzing the muscle and in a much lesser form. I’ll say it again, it just relaxes the muscles, so don’t go all runnin’ out to get yerself boxes of this stuff because it’s cheaper! 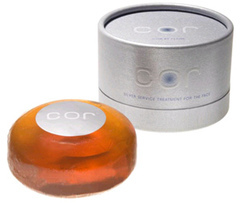 I didn’t realize how much I missed my ol’ basic face soap until I used the much talked about COR Silver Series Face Bar ($125/4.2oz and $14/sample size @ corsilver.com). Many years ago I started my face routine using Clinique’s Facial Soap (you can’t beat the price and it lasts really long) and since then have used I don’t know how many different cleansers. But in the end, the bar reigns! This one was discovered by accident and it does everything a good cleanser should. It’s made with silver (known for it’s anti-bacterial and healing qualities), four kinds of collagen, provides a SPF of 15 and a low pH level of 7.2 so it helps both sensitive types and those prone to acne. Why the high price tag? It claims the ingredients are tinier than average so they effectively sink into pores to do their work. I don’t know how that’s possible but I do know how my skin feels after I use it. Clean. Just plain clean, not stripped clean. Try the sample size to see how this works for your skin or just dive in with the big one as it should last you 6 to 9 months.